Booking information: Email Sofia Gonzalez at sofia@wildwoodpark.org or use Wildwood’s online tour request form. See below for more details. As part of the Art to Go! program at Wildwood Park for the Arts, Praeclara’s artistic director, Bevan Keating, will direct a touring production of this charming children’s operetta based on a Brothers Grimm folktale. 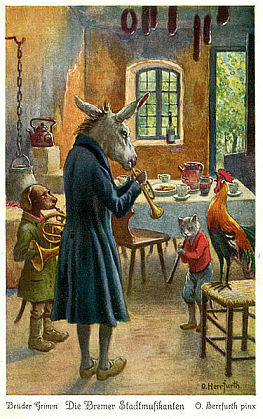 The audience joins Dorabella the Cat, Barcarolle the Dog, Eddie Pensier the Rooster, and General Boom the Donkey as they journey the roads to Bremen to form their own band of musicians. The story, adapted for the stage by John Davies, focuses on themes of enhancing communities through teamwork and collaborative problem solving. Students in Pre-K through 5th grade will delight in the classic opera music of Offenbach, Rossini, Donizetti, Sullivan, and Verdi as they also learn to consider the feelings of others in all situations. Cast members will conduct question and answer sessions with the audience after each performance. Featured songs include “Eh hop! Eh hop!” from Orphee Aux Enfers, “Pace e gioa sia con voi” from Il Barbiere di Siviglia, “Ai capricci, della sorte” from L’Italiana in Algieri,” and “Things are seldom what they seem” from H.M.S. Pinafore. 1. You will need a performing space of 20 ft. by 20 ft., plus seating for students. 2. The cost for one 45-minute performance is $500. The Arkansas Arts Council offers up to 40% fee assistance to non-profit Arkansas-based organizations certified as exempt from federal income tax under section 501(c)(3) of the IRS code (this includes public schools, institutions of higher learning, churches, and government units). 3. Fill out the online tour request form on the Wildwood Park website, or contact Sofia Gonzalez, Wildwood’s Educational Programs Coordinator. Email her at sofia@wildwoodpark.org or call (501) 821-7275, ext. 259. Once you’ve booked your performance, Wildwood will provide study guides and worksheets that offer in-depth information about the play, as well as carefully designed activities that will enrich the theatre arts experience and fulfill Arkansas Department of Education Curriculum Frameworks. Wildwood will also provide you with press information to help with local publicity.